Florida’s famous orange groves are under attack! Florida’s famous orange groves are under attack! Citrus greening, a disease that results in small, bitter oranges, has taken its toll on nearly every growing operation in the state. With fewer oranges being produced, prices are on the rise. Here, nine fantastic dishes to make with the fruit while it’s still affordable. How do you upgrade the classic dip? Adding oranges and pineapple gives it a fun, fruity twist. Juicy oranges add wonderful citrus flavor to this crunchy salad. This terrific brunch mocktail is made with fresh orange juice, orange syrup and garnished with thin strips of orange zest. Orange juice and zest coat these fast chicken wings. April Broomfield’s delicious pancakes are even more exquisite thanks to the vibrant orange syrup. Jacques Pépin makes the classic French dish with navel oranges. This summery cocktail contains fresh orange juice, orange-flavored vodka and orange-flower water. “I love a hot fudge sundae, but this is more refreshing,” says Jimmy Bradley about this excellent dessert. 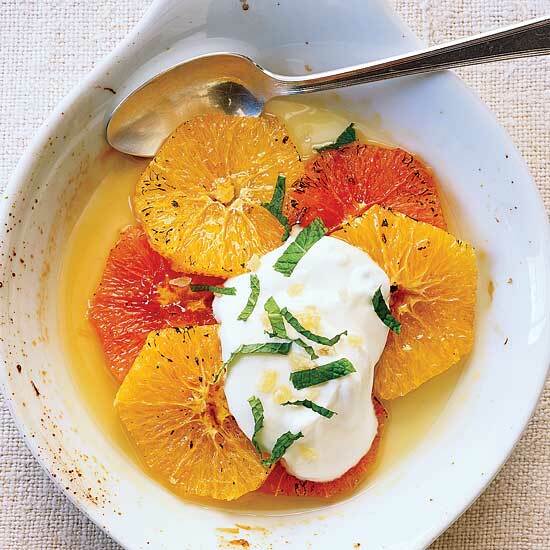 This 30-minute dessert features warm, sweet orange slices topped with whipped crème fraîche, candied ginger and shredded mint.